John Parker (July 13, 1729 – September 17, 1775) was an American farmer, mechanic, and soldier, who commanded the Lexington militia at the Battle of Lexington on April 19, 1775. Parker was born in Lexington to Josiah Parker and Anne Stone. His experience as a soldier in the French and Indian War (Seven Years War) at the Siege of Louisbourg and conquest of Quebec most likely led to his election as militia captain by the men of the town. He was in poor health from consumption (tuberculosis) on the morning of April 19. Tradition reports his order at Lexington Green to be "Stand your ground. Don't fire unless fired upon, but if they mean to have a war, let it begin here." He witnessed his cousin Jonas Parker killed by a British bayonet. Later that day he rallied his men to attack the regulars returning to Boston in an ambush known as "Parker's Revenge." 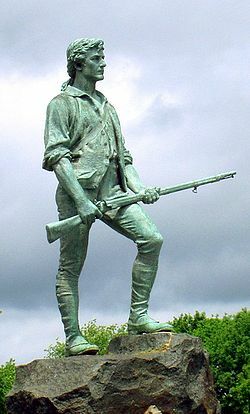 The above statue, known as The Lexington Minuteman, was originally meant to represent the common Minuteman, but has now become accepted as Captain John Parker. It is by Henry Hudson Kitson and it stands at the town green of Lexington, Massachusetts. It is not actually based on Parker's appearance, as no known likenesses of him survive today. (Right) Map depiction of the outbound routes taken by Patriot riders and British troops in the Battles of Lexington and Concord on April 19, 1775. This was his only military action in the American Revolutionary War. He was unable to serve in the Battle of Bunker Hill in June, and died of tuberculosis in September. Parker's grandson donated his musket to the state of Massachusetts. It hangs today in the Senate Chamber of the Massachusetts State House. The Parker Homestead formerly stood on Spring Street in Lexington. A tablet marks the spot as Theodore Parker's birthplace; Theodore, a relative (grandson) of Captain John, was a transcendentalist and minister who was good friends with Ralph Waldo Emerson and Henry David Thoreau. (Above) Map showing the route of the British army's 18-mile retreat from Concord to Charlestown in the Battles of Lexington and Concord on April 19, 1775. It shows the major points of conflict, as well as showing the route taken by Hugh, Earl Percy's reinforcements. Captain John Parker is still the symbol of one of the largest mutual companies, Sentry Insurance. His full-body profile (including musket and boulder) is the crest of all U.S. Army Reserve battalions' and regiments' coats of arms. Considering that the book is about such a serious subject, it is also surprisingly funny.....up until the shooting starts. This is certainly a case of farce turning into tragedy. If you'll pardon the pun, General Gage was such an engaging fellow that he made it clear that he wanted the Colonials handled with kid gloves. Again, up until the shooting started, the British were quite accommodating. They were very polite towards the populace, even when searching for weapons and powder. They went to one house and there was a room the owner wouldn't let them go into. She said that there was a woman in that room who didn't feel well, so the British didn't press the issue and didn't search the room. Of course, that was the one room in the house where gunpowder was being stored! The British excursion from Boston was a comedy of errors. It was supposed to be a surprise, but the Colonials knew all about it. There were endless delays in leaving Boston, which gave riders such as Paul Revere plenty of time to get to Lexington and Concord to warn people to hide weapons and gunpowder. Gage had given detailed orders on what he wanted done. For example, he wanted the soldiers to take confiscated musket balls, put them in their pockets, and drop them in dribs and drabs in ponds and streams. The soldiers actually found very little, since the inhabitants had plenty of time to hide things, but instead of dropping things in small quantities the soldiers pretty much dumped whatever they found in just a few areas.....making it easy for the Colonials to retrieve most of what was confiscated! You could say there was a lack of brainpower on the "hometeam" side as well.....such as tearing up the planks of a bridge leading out from Boston so that the British could not cross it, but then leaving the planks stacked up in plain sight.....so the soldiers just had to nail them back down and they were back in business! A running gag throughout much of the book is the relationship between Sam Adams and John Hancock. The author portrays Adams as a shrewd propagandist, a man who spent 10 years trying to stir up a rebellion and finally knew the big chance when he saw it. Hancock is portrayed as none-too-bright, vain, wealthy and easily manipulated by the psychologically astute Adams. Adams and Hancock were so sure the British were after them that they acted like two crooks on-the-run. Mr. Tourtellot's thesis, from going through the primary sources on the British side, is that the British couldn't have cared less about capturing the "dynamic duo." They just wanted to confiscate some cannon and gunpowder...period! To support his appraisal of Hancock as dunderhead, Mr. Tourtellot gives many examples. However, the funniest is probably when Adams and Hancock are in hiding in Lexington on the morning of April 19th, and suddenly they heard the sound of gunfire. This is what Adams was waiting for! He knew this could be used to unite the Colonies, finally, in a drive towards independence. Adams said, "Oh, what a glorious morning is this." Hancock's reaction was that he thought it was a strange time to comment on the weather! Adams (you have to wonder whether he smacked his head in exasperation) clarified the situation: "I mean what a glorious morning for America." Adams and Hancock, convinced that the British were coming (for them!) moved on to their next "safe house." Hancock had a messenger take a note to his aunt and fiancee, asking them to come and join him. Lest you think that Hancock by now might have had an inkling as to the importance of the day's events, he made sure he included in the note the following: He directed them "to bring the fine salmon that they had had sent to them for dinner." Of course, once the fighting starts, Mr. Tourtellot does not make light of matters. The British retreat towards Boston is recorded in harrowing detail...they were surrounded by superior numbers and were fighting for their survival. They sent out flanking parties to deal with snipers and the flanking parties did what they needed to do...such as burning down homes that they suspected were being used by snipers and killing able-bodied, though unarmed men, on the assumption that they were rebels. Not a bad assumption, really, when you understand that even men in their sixties and seventies were lurking in the woods, taking potshots at the British. One remarkable part of the book is where the soldiers came upon 78 year old Samuel Whittemore, who had just killed a couple of Redcoats. They shot Whittemore and beat him severely. They were satisfied that they had "killed the old rebel." Amazingly, Mr. Whittemore lived another 18 years....not dying until the ripe, old age of 96! Mr. Tourtellot also deals with the aftermath of the battle....showing how Sam Adams and others got maximum propaganda value from the day's events, exaggerating British atrocities (which were in actuality extremely rare) in order to set the Colonies on the road to independence and to influence opinion back in England. I consider this book a welcome and necessary addition to my collection of books dealing with the American Revolution. "The book also contains excellent maps that help the reader visualize the action and route of march. The author has succeeded in breathing exciting life into a little confrontation that wrote large upon the pages of history." Many of these families followed interesting migration and movement patterns from Western Europe and beyond to the United States well over 200 years ago. Included in these volumes is information such as last wills and testaments, period photographs of towns, buildings and landscapes, portraits of family members, and descriptions of business interactions. Encompassing such comprehensive and personal information, this collection will appeal to genealogists, family history researchers, as well as descendants and casual historians. Review: With Zeal and with Bayonets Only is the most important book on the military side of the American Revolution to see print in this century. It completely revolutionizes our view of battle in the War of Independence (From Captain John Smith to Napoleonic Tactics to British Surrender). Everything that came before it dealing with combat in this conflict is obsolete and must be reconceptualized and rewritten. Based on meticulous research, With Zeal and with Bayonets Only, is both well written and authoritatively argued. Matthew H. Spring succeeds in vindicating the reputation of the British troops who attempted to crush American independence. They were not hidebound, unthinking machines good only for parade-ground evolutions and set-piece European battles. The British Army that fought in North America from 1775 to 1783 was what modern American officers call "a thinking army." British officers, such as William Howe, were well aware that they had to adapt to American conditions from the outset, and they trained all their foot soldiers to function like light infantry. After Bunker Hill, they invariably led their Redcoats into battle in open order. Lacking large amounts of cavalry, they trained their foot soldiers to move quickly to overtake and strike a speedy foe. In battle, the Redcoats usually sought a quick decision. They preferred to close to within 75 yards of the enemy, fire a volley, and then charge with the bayonet. These tactics brought them victory more often than not. Spring realizes, of course, that the British lost the war, and he explains how these frequently successful tactics contributed to that defeat. The fact that British officers tried to clinch victory on the battlefield reflected an improper appreciation for the political dimensions of the Revolution. In addition, pressing the enemy with troops deployed in loose order worked only so long as the attackers were superior to their foes. As the Revolution progressed and the Continental Army upgraded its own fighting skills, the Redcoats' tactical practices backfired on them -- as seen at Cowpens and Guilford Court House. Nevertheless, Spring demonstrates that the British Army of the Revolution was a much more formidable force than most Americans realize. His book makes General George Washington's victory seem all the more incredible and admirable. With Zeal and with Bayonets Only is must reading for anyone who wants to think they possess any real understanding of the American War of Independence. About the Author: Matthew Spring holds a Ph.D. in history from the University of Leeds and teaches history at Truro School, an independent secondary school in Cornwall, England. In particular, he documents the use of turning movements, the loosening of formations, and a reliance on bayonet-oriented shock tactics, and he also highlights the army's ability to tailor its tactical methods to local conditions. Written with flair and a wealth of details that will engage scholars and history enthusiasts alike, With Zeal and with Bayonets Only offers a thorough reinterpretation of how the British Army's North American campaign progressed and invites serious reassessment of most of its battles. This groundbreaking book offers a new analysis of the British Army during the "American rebellion" at both operational and tactical levels. Presenting fresh insights into the speed of British tactical movements, Spring discloses how the system for training the army prior to 1775 was overhauled and adapted to the peculiar conditions confronting it in North America.